These are just a sampling of the words used by the food allergy community to describe One Dish Cuisine in Ellicott City, MD – now deemed by AllergyEats as The Most Allergy-Friendly Restaurant in America! 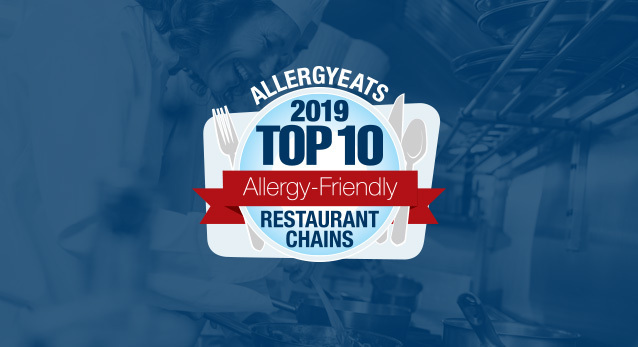 Not only does One Dish Cuisine have the most AllergyEats user reviews of any restaurant in the country, but every one of those reviews has awarded One Dish Cuisine a perfect score for food allergy-friendliness, most with gushing commentary as well! When we first wrote about One Dish Cuisine in a January 2015 blog (Dishing With One Dish Cuisine: The #1 Rated Independent Restaurant on AllergyEats), owner Maureen Burke shared her story of personal motivation behind creating a restaurant designed specifically for the diner with dietary restrictions. 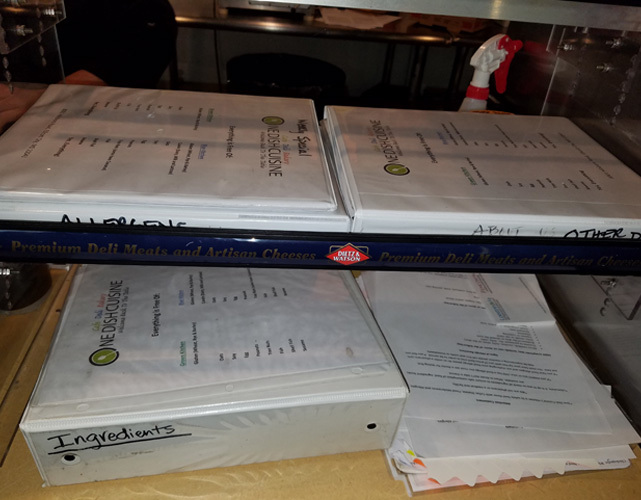 At that time, Maureen also explained the food allergy protocols she implemented at One Dish Cuisine to keep her customers safe and satisfied. I had to experience it for myself. 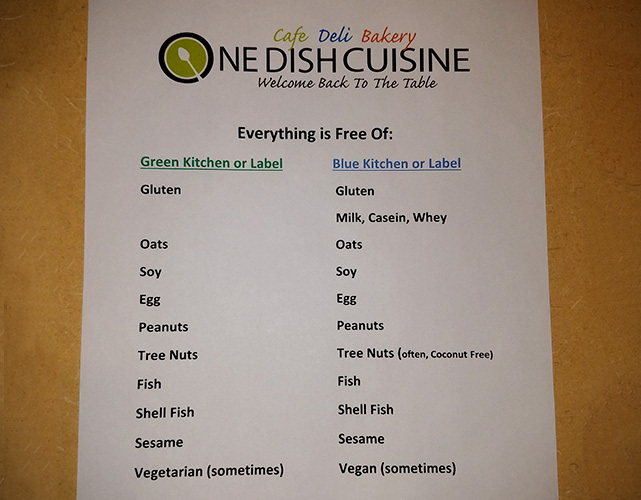 One Dish Cuisine is completely free from 7 of the “Big 8” most common allergens – all except dairy – plus gluten and even more! Of course, One Dish takes care of its dairy-allergic customers just as carefully and “caringly” as all other diners through the use of two completely separate kitchens – the green kitchen (with dairy) and the blue kitchen (no dairy) – offering virtually the exact same menu from both. One might wonder why they have dairy in the restaurant at all if each menu item can be made without it. It all comes down to taste. While Maureen has been genius at learning to use different ingredients to mimic the taste of meals you could get elsewhere if you didn’t have food allergies, she admits that recreating the texture of a traditionally dairy-based meal (like pizza or grilled cheese) without dairy is difficult and compromises quality. But the magic behind One Dish Cuisine’s success as an allergy-friendly restaurant is far greater than just the ingredients in the restaurant. It is much more significant than just making every meal from scratch. It’s more than just prohibiting outside food from the restaurant in order to safeguard against cross-contamination. It goes beyond the willingness to stop one of the kitchens – regardless of the time of day – for a full cleaning when someone comes in with a non-traditional food allergy or allergies. It’s bigger than the strict vetting of their food vendors – and periodic testing of their products – to find out exactly what’s in the food and whether there has been any cross-contamination risk in the supply chain. It even goes further than prohibiting employees from bringing their cell phones into the restaurant (since those phones are in their hands all day, thus highly likely to transport someone’s allergens). And if that’s not enough, it goes beyond deliberately not locating One Dish Cuisine near another restaurant for fear of allergy contaminants coming in through the shared ventilation system! The magic, in fact, is owner Maureen Burke, herself beset by celiac disease and a dairy allergy since before these conditions were as common as they are now. “I know how isolating it can be to have food allergies,” Maureen explained. These stories about incredible guest loyalty and gratitude towards One Dish Cuisine have been coming my way for years from many different sources, so I decided to reach out to some of these devoted customers to hear their amazing stories directly. 13-year-old Max has allergies to wheat, dairy, eggs, peanuts, tree nuts, sesame, barley, rye, and oats (he fortunately outgrew a coconut allergy). He also has mild cerebral palsy. Max and his family of four rarely eat out in Rochester. Seeing the look on the faces of restaurant staff, as they struggle to answer the family’s questions, makes them feel it’s too risky, especially when the servers ask “Well, what CAN he eat?” Max’s family, of course, understands the danger of exposure to Max’s allergens and, as recently as last year, had to use epinephrine on Max with a rush to the Emergency Room. They’ve resigned themselves to what many in our community do at one point or another – they bring food from home for Max to eat at a restaurant… when they have to go to one. But for the most part, they avoid restaurants altogether. They have been fortunate enough to visit Disney World and have Max’s food allergies accommodated there, but of course the high cost of that trip makes regular visits prohibitive. A year-and-a-half ago, Max’s sister Abby had a soccer tournament in the Baltimore area (where Ellicott City is a suburb), which the whole family attended. As always, Max’s mother, JoAnne, pre-cooked meals to bring on the trip for Max. This time, however, she decided to research restaurants around the Baltimore area (using AllergyEats amongst other tools: shameless plug) and found One Dish Cuisine. She read the amazing reviews, reviewed the restaurant’s website, and wondered if it could all really be true. She and Max couldn’t comprehend the possibility of a restaurant where Max could order ANYTHING right off the menu. It was a trip they had to make. And yes, it was all true. To try to sum up the depth of this discussion would be impossible without its own blog entry, but the bottom line is, in Max’s words, “It was really exciting. I could have anything. I felt like a normal person. It was really, really heartwarming – it made me feel great and I was happy. I was in Heaven. I gained 8 pounds that day.” Over a few visits during that trip, Max ate pizza (all different toppings), a burger, French fries, French toast, donuts, soft pretzels, a club sandwich, pasta, a chef salad, and even REAL birthday cake. (His favorite of all is Maureen’s pizza.) They returned for every meal during the rest of that trip, took home loads of frozen food, and have since become regulars, despite living over 300 miles away, taking home as much food as possible after every visit, especially the pizza! 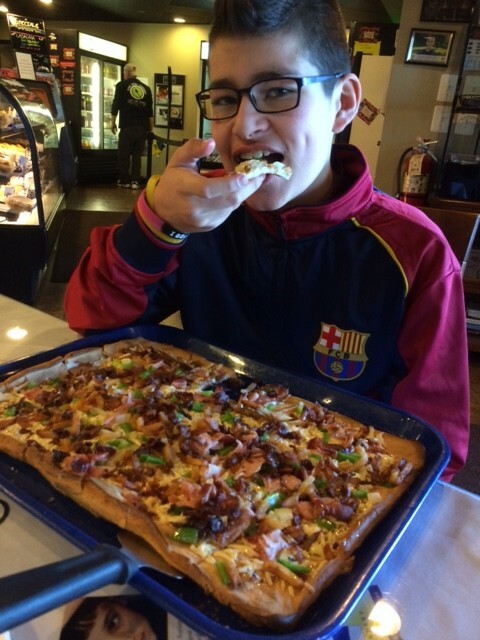 In fact, Max’s family planned his 13th birthday around events in the Baltimore area, all so that they could enjoy EVERY meal of Max’s multi-day birthday celebration at One Dish Cuisine! Everything else, including taking in a Baltimore Ravens game, was literally the afterthought of the festivities. Max says that One Dish Cuisine is the only place where he can eat without worrying. He’s more comfortable there than even at Disney World, generally considered the Gold Standard in food allergy dining. And how’s this for reciprocal love? Max and his father, Steve, are going on his 8th grade trip to Washington, DC in a few months. The class will be dining out at restaurants each night, which obviously won’t work for Max. Enter Maureen to the rescue. She promised to make a batch of food for Max and meet up with he and Steve so Max can enjoy his restaurant meals during that trip just like his classmates. Your eyes still dry? My second call was to Courteney, mother of 11-year-old Miles, who has severe allergies to wheat, rye, barley, milk, eggs, peanuts, tree nuts, sesame, mustard, and shellfish. Miles, like Max, doesn’t get to eat restaurant food generally. The family does go out to eat quite a bit (as many busy families do), but Courteney always cooks and brings Miles’ food with them for safety. Miles doesn’t complain. Even at 11, he understands the difficulty of accommodating his long list of allergies and the importance of staying safe. Miles lives near Washington, DC, about 45 minutes away from One Dish Cuisine. One day, 3 or 4 years ago, Courteney came across One Dish Cuisine online and decided they should check it out. She called Maureen to talk with her first. She didn’t want to get Miles’ hopes up only to have him disappointed when they got there. Maureen took the time to explain the whole setup at One Dish Cuisine and how they take every precaution to keep their guests safe. The encouragement on the phone was enough to convince Courteney that they should give it a shot. Courteney was extremely nervous when they arrived at the restaurant and remained nervous despite the significant amount of time Maureen spent with them learning about Miles’ specific food allergies. Miles seemed nervous and hesitant too, but Courteney and Maureen reassured him. And it was magic! 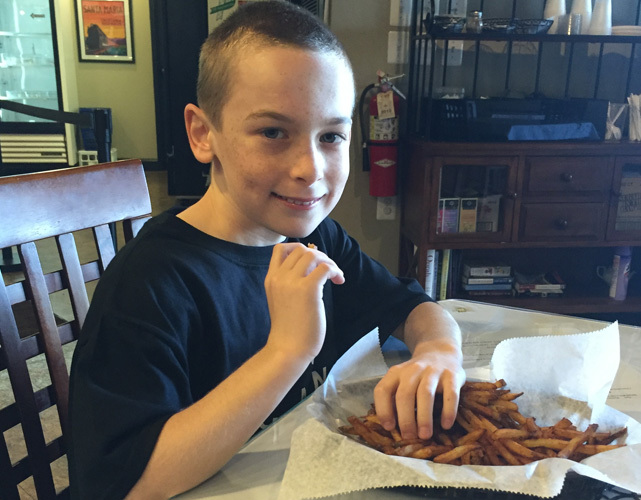 Miles was able to eat anything off the menu – despite that long list of allergies – and feel like a normal guest. “It was so overwhelming for him,” Courteney explained, and she cried with joy watching him eat that first meal. Courteney recalls that their family of four probably ordered enough food for 10 that day so Miles could try as much as possible. He tried chicken nuggets, French fries, a cheeseburger (for the first time), a cupcake, and more. One Dish Cuisine was, and remains, the only restaurant where Miles can order off a menu… and Courteney can’t imagine trusting anyone else. She’s been spoiled by the care and love Maureen puts into serving her food-allergic guests safely. And the rest of the family loves the food too! Being free of allergens doesn’t require any sacrificing of quality or taste as Maureen has proven [and I can testify to myself]. Courteney still gets emotional every time she sees Miles being able to eat anything he wants off the One Dish Cuisine menu and feels it’s important to share this tremendous success on Facebook every time they go. In fact, One Dish Cuisine now makes the cakes for all of Miles’ birthday parties. Courteney praises their beauty AND great taste, acknowledging that other guests have no idea that the cakes are free of so many food allergens. Miles’ family now has a dedicated freezer in their basement just to store the frozen food they bring home every time they’re near One Dish Cuisine (roughly every 4-6 weeks they make a run to “fill up”)! They bring home at least a dozen cupcakes, 10 Mac ‘n Cheeses, 10 pizzas, chicken nuggets – as much as the cooler and freezer will hold. “There’s an ongoing resupply going,” Courteney explained. What has really amazed me was learning that these stories were NOT the exceptions – they’re the norm! One Dish Cuisine has gained an amazing following of proud and vocal visitors from all over the country who either design trips around being able to eat at One Dish Cuisine or go out of their way when traveling to pass through Ellicott City and enjoy Maureen’s food. In fact, One Dish Cuisine has now had visitors from every state in the U.S. and many from overseas as well (Canada, Mexico, Great Britain, Israel, and more). “People are so appreciative of the allergy-friendly environment that we’ve created here that most cry happy tears and want to hug us,” Maureen said, beaming. Over and over, similar comments are shared on AllergyEats or posted on Facebook – “it’s the only restaurant where we can eat,” “we can eat anything on the menu,” “the owner takes such amazing caution to feed us safely,” “the food is great,” and on and on. And I’ve never seen a single bad review from the food allergy community! Think of that. One Dish Cuisine has more ratings on AllergyEats than any other restaurant in the country – and every one of them has shown a perfect score! I always say even the best restaurants will have an occasional mistake, but so far Maureen is proving me wrong… and I love it! She proudly boasts that she has never had a customer that she couldn’t accommodate. Oh, and did I mention that her customers all think the food is delicious? It doesn’t taste like “food allergy food” (whatever that is). 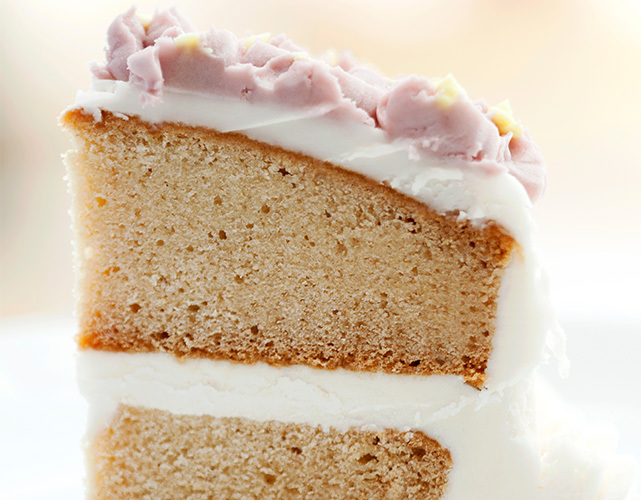 It is healthy and appealing – great for those with and without food allergies. 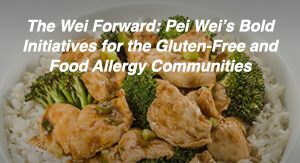 This blog post is incredibly long because I’ve tried to capture just how allergy-friendly and amazing One Dish Cuisine is when it comes to accommodating our food allergy community. But even all this doesn’t do justice to Maureen’s efforts. Missing is the fact that the restaurant is unfortunately not, at this point, a profit generator. In fact, one can confidently say that Maureen (along with her husband) is doing this as a labor of love for the individuals in our food allergy community. What I saw at One Dish Cuisine was a mission even more than a restaurant. Maureen admits candidly that she and her husband are not taking home paychecks for their full-time work at the restaurant, but she doesn’t have time to dwell on that – she’s too focused on how best to take care of her customers, roughly 90% of whom come in as part of a party with food allergies. (This isn’t to say that Maureen doesn’t want to – or know she has to – generate profits. She’s trailblazing the industry right now, so there’s no model to follow, but she has some well thought-out plans under consideration.) Courteney – Miles’ mom – recognizes this. “It’s not a profitable business; it’s a labor of love. She’s so dedicated to the community. She should be nominated as a CNN Hero.” I agree. One Dish Cuisine is so well regarded that they have even been contracted by major hospitals in the area (Children’s National Medical Center, Anne Arundel Medical Center, Carroll Hospital Center) to make food for their patients with food allergies. Maureen is very proud of that, as well she should be. It’s become unfortunately common to hear about hospitals that aren’t equipped in their kitchens to accommodate food-allergic patients. So what’s next? Well, it’s time for One Dish Cuisine to expand. (Don’t you think?) Maureen is currently planning to open a new restaurant in Bethesda or Rockville, MD within a year. 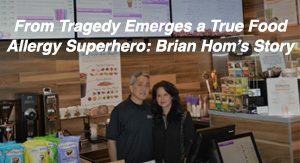 In this more populous area, it is hoped that the number of customers will be high enough to generate profits, while of course not sacrificing the same incredible personal treatment and extraordinary food allergy protocols that each customer deserves and gets in the Ellicott City restaurant. The new restaurant will likely incorporate an attached Irish pub concept as well, hopefully a profit driver to help subsidize the cost of running an allergy-friendly restaurant the only way Maureen is willing to accept – all in! In my discussions with Maureen, I asked her whether it will be possible to properly serve her food allergy customers at both locations with the same love and care they currently get in Ellicott City – mainly because she can’t clone herself. But, as with everything else Maureen has done, she has thought this through in detail and was able to describe to me what it would require. Franchising is also a possibility, but a very difficult proposition as Maureen would demand the same love of customers that she currently shows, and, of course, the same great efforts to accommodate all food-allergic guests. Combining that kind of deep devotion to each guest – always enthusiastic about the “mission” despite the challenges – with the ability to run all aspects of a restaurant is a rare and unique combination. 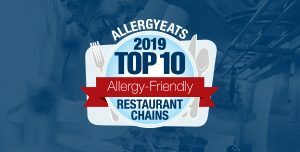 Let me end this long blog post by commending One Dish Cuisine for being name AllergyEats’ Most Allergy-Friendly Restaurant in America! And I’ll also invite your comments below. We’d love to hear from guests of One Dish Cuisine as well as those who now may want to try it. 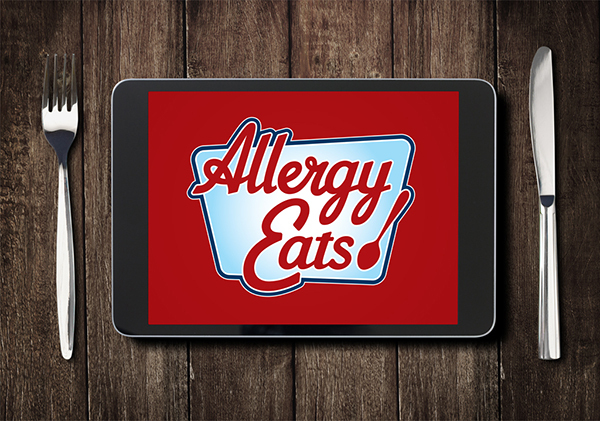 And remember, wherever you dine – whether at One Dish Cuisine or anywhere else in the country – please take a minute to rate your restaurant experiences on the AllergyEats app or website. Each new rating makes AllergyEats a more valuable tool for our entire community. You may even help someone find the next One Dish Cuisine! We live outside of Philadelphia, but we made sure to visit One Dish Cuisine a few years ago when we were in the Rockville area for a Baptism. I WISH we lived closer. 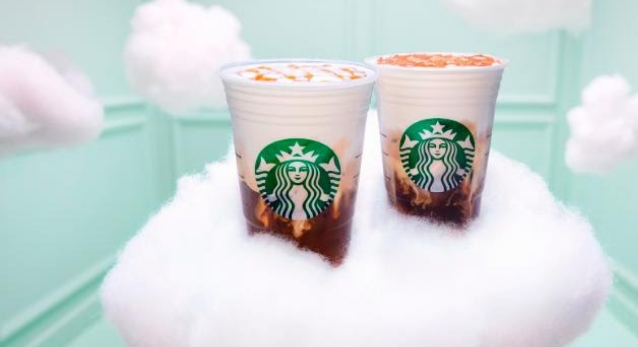 We would visit every week if so! I sure wish you were in Michigan! On my next trip to MD, I will have to bring my peanut, treenut, coconut, fish, shellfish, dairy allergic family there! Congratulations! We’ve been welcomed guests at ODC for several years now. We’re lucky we live so close! My first trip was with my food allergic twin girls. We started going regularly as a family. And when our youngest, our son, was also diagnosed with food allergies (many more than his sisters) it was great to know we had a safe place for everyone to eat. I have to thank Maureen because when my son was having feeding/swallowing issues she was the one who mentioned a rare food allergy called eosinophilic esophagitis (she even had a book on it in the restaurant!) and sure enough, he was diagnosed a couple months later via endoscopy. And a couple years ago, when my then 4-year-old failed her soy challenge and was diagnosed with Food Protein Induced Enterocolitis Syndrome, our first stop on the way home from the hospital was ODC! I told Maureen about our fail and the added diagnosis. She was so receptive and caring (even gave my daughter a cookie for her bravery!). Ms. Maureen and Mr. Dave (and their staff) are one in a million! We love this place and make it a point to stop here when we travel from the Boston area down to NC. We hope that the restaurant has a long life! 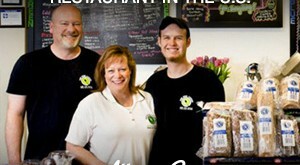 I am Celiac and would kill to eat at a place like this!! Please open I. Sarasota Fla. I have been in the restaurant many years and I know this will be very successful!! Do you have gift cards that can be purchased? This is so wonderful to read. We haven’t been comfortable yet allowing our 2 year old (wheat, egg, peanuts) to eat anything from a restaurant. We live in Rockville and promise to be regulars at the new restaurant – and will make plans to get up to Ellicott City sometime soon! Thank you all for the positive comments and encouragement. We love doing what we do and are so glad to welcome our under served population back to the table! Yes, we offer gift certificates, you can call the cafe at 443-759-6344. LOVE ONE DISH!! I drive down twice a year from outside Philly! I bring a cooler with me each time and bring back treats for my friends and family back home! I get a bunch of treats for myself too- but most don’t make it back home! They’re just to delicious to put down! One Dish is the most amazing restaurant! Finally, a place that I know 100% that I will be safe! The food is outstanding! And the desserts are absolutely wonderful! And, of course, Maureen is a sweetheart! I love this restaurant! My son turned 5 in September and this was the first year he was able to have a bakery birthday cake. He was so excited to have a Captain America birthday cake. When we first visited the restaurant when my son was 4, my son was so happy. He looked comfortable the entire visit. He especially loved the meatballs. The most exciting part of the visit was dessert. It was the first time he was able to order dessert at a restaurant and he was able to look at the desserts and pick what he wanted. It was an emotional time for my family and we took pictures to remember the first visit. This is a great restaurant. The owner and staff are knowledgeable and kind. I can’t wait to visit again. I am Miles’ Granddad and was with him when he made his first visit to One Dish. He was so excited when in looked in to the displays at the front counter. He saw so many items he recognized, but never could eat. Kept asking for verification as he went from one end to the other. Thank you, just as I did that first day, for letting our family enjoy Miles’ happiness on his very special day. Bless you and your staff. Maybe someone could be trained on her style, then open a school for others to learn. There seems to be a huge market for this menu, and she actually can’t clone herself (yet). Why not take a protege, who could, in turn, create an army of One Dish chefs? I don’t have any food allergies in my family, but we’d go just the same, for whole, nutritious foods! Do they offer dishes for HFI( Hereditary Fructose Tolerance)? Susan, we can definitely accommodate HFI Diet..we have full ingredient lists for everything and most items are made from scratch by us, so not a huge problem. Obviously you will be limited in the bakery area, but there are many items (meals) that don’t contain fruits or sugars or their derivatives. Our food allergy family thinks this is a dram come true. We can’t wait for you to expand in New England! Kudos!!!!!! Wish you were in NJ!!! My wife (GF) and I made the trip a few months ago, and we were blown away. Both by the food (which tasted quite good to me as a person without allergies, and was amazing for my wife) and the treatment we received as customers. This restaurant is an absolute treasure. My daughter has Celiac and I can just imagine her delight if she were able to order whatever she wanted! How wonderful. I would love to know if a franchise opportunity ever becomes available. Between myself, and my brother-in-law who is a chef and prides himself on creating delicious and safe foods for his niece and as a head chef at WDW banquets…. maybe I could recruit him over and we could have a Central Florida location. Thank you for devoting yourself to such a worthy cause and helping people enjoy a stress-free dining experience! Today was such a nice surprise. The owner was fabulous and introduced us to all the offerings of One Dish Cuisine. Really grateful to have found this place and will return again. I came here around a year ago and it was one of the safest experiences I’ve had at any restaurant. I have a severe nonceliac gluten sensitivity and even a tiny cross-contamination sends me on a downward spiral. I rarely go out to eat and when I do, I do my research. I researched this place before coming and it was a safe haven. As a gluten intolerant vegetarian, I’ve wanted just a simply veggie burger for years. I got it here and it was amazing. My only qualm with the place was that Dave was a bit condescending, almost implying that I didn’t know about my condition. This may have been due to my fiancé ordering first and he has no allergies and intolerances. When it was my turn to order, he might have assumed that I simply had a dietary choice of not eating gluten rather than an actual condition. I’ve come across this a lot so I understand where he comes from, since he deals with both intolerant/allergic individuals and not. Other than just a bit of feeling unwelcome, this is the best place to go. I am willing to pay extra just so that I don’t have to feel sick after spending time with family eating out. I’m currently at home while my family is out to eat because I couldn’t bear another illness-inducing experience. ODC is a truly a haven where everyone can feel normal and safe. After reading about ODC , I could only wish it was in Indianapolis. 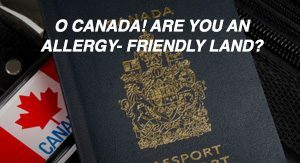 My 3 year old who is allergic to diary, gluten, nuts , sesame, chickpea ate only once at local restaurant only to end up with anaphylaxis and since then never dined outside. On top of it he is very picky eater. If you ever have any plans of expanding to Indianapolis, I would be more than happy to collaborate with you. Really appreciate the kind work you are doing for such special ppl. WHERE IS THIS RESTAURANT?! All the goid comments in the world don’t help if you don’t bother to list the location. Duh. Hi Liten. While there are, in fact, multiple references to the location of One Dish Cuisine throughout the article (including a link to the listing on our app and website citing the specific address), it’s fair to ask us to point it out more clearly. The address is 8001 Hillsborough Rd in Ellicott City, Maryland. Hope you get to visit and enjoy this amazing restaurant.